circumstellar dust disk and possibly an asteroid belt. 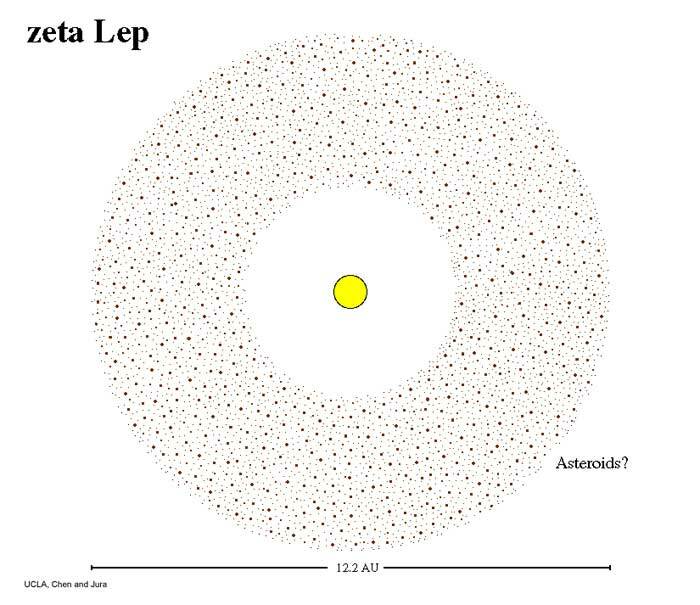 Zeta Leporis is located about 70.2 light-years from Sol. It lies in the northeastern part (5:46:57.3-14:49:19.0, ICRS 2000.0) of Constellation Lepus, the Hare -- northeast of Arneb (Alpha Leporis) and Nihal (Beta Leporis), west of Eta and Theta Leporis, and southeast of Saiph (Kappa Orionis). In 1983, astronomers used the Infrared Astronomy Satellite (IRAS) to determine that the star has a remnant, circumstellar dust disk (Jean Cote, 1987). 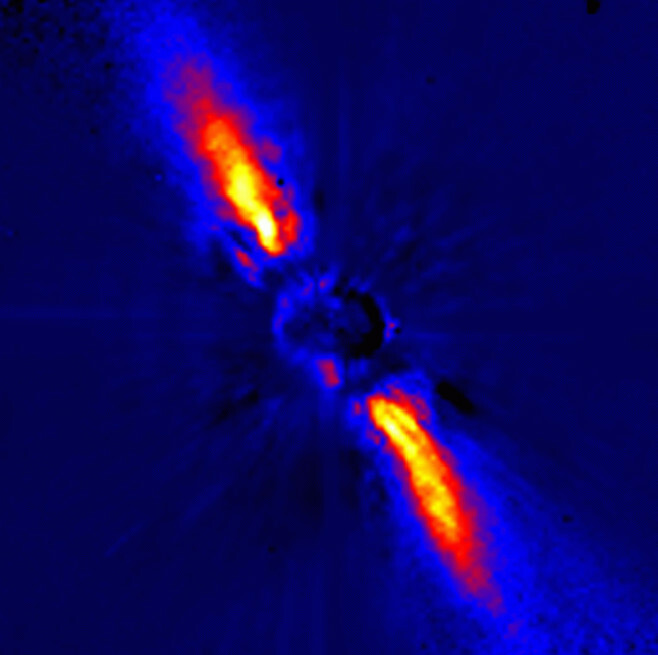 Subsequently, astronomers announced in June 2000 that abundant, warm dust around this star was strong evidence of a massive asteroid belt which may also indicate that planets are or have already formed in this system (UCLA press release, Zeta Leporis; and Chen and Jura, 2001 -- details below). Zeta Leporis is a bluish white main sequence dwarf star of spectral and luminosity type A2-3 Vann. The star may have around about twice Sol's mass, more than 1.7 times its diameter, and over 15 times its luminosity. It appears to be very young, probably around 100 million years old but could be anywhere between 50 and 500 million years old. At least one past spectroscopic analysis suggested that the star might have a binary companion. Useful catalogue numbers and designations for the star include: Zet Lep, 14 Lep, HR 1998*, Gl 217.1, Hip 27288, HD 38678, BD-14 1232, SAO 150801, FK5 219, and Wo 9190. In June 2001, astronomers (Christine H. Chen and Michael Jura) announced that Zeta Leporis is enveloped by swirling dust in quantities and at temperatures that indicate solid rocks are colliding and generating dust in an asteroid belt that might be similar to the one surrounding our own Sun between Mars and Jupiter (UCLA press release, Zeta Leporis; and Chen and Jura, 2001). "We believe we see either the remnants of planet formation or material that may become planets," Chen said. By observing at two infrared wavelengths, Chen and Jura estimate that the average temperature of the dust around the star is around 340° K (150° F or 65° C), hot enough to suggest that the dust grains may be as close as 2.5 AUs to the star. The star was found to have a ring of dusty debris in 1983 along with some other young stars (Jean Cote, 1987). Then, in 1991 astronomers learned that this debris ring was unusually warm and close to its parent star, unlike other disks that are farther out and so colder (Aumann and Probst, 1991, pp. 266 and 269). This dust, given its known properties, should spiral into a star within 20,000 years, according to current theories of physics and star formation. Since Zeta Leporis is much older, its observed dust grains were not there when the star first formed, and so they must be generated through some secondary process such as collisions between larger objects. These presumed asteroids could be the size of small or large boulders, which collide and grind against each other to form micron-sized grains. Belt in the Solar System. From the strength of the infrared signature of the dust, the astronomers estimate that the mass of the asteroid belt may be about a thousand times that of the Main Asteroid Belt in the Solar System lying between Mars and Jupiter. The ring of debris appears to be confined to a region between 2.5 and 12.2 AUs from the star. Previous research reported in 1999 suggested that these circumstellar dust disks tend to disappear when a star is about 400 million years old -- towards the upper end of the age estimate for Zeta Leporis. 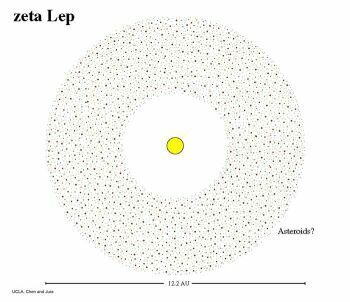 The orbit of an Earth-like planet (with liquid water) around Zeta Leporis may be centered around 3.9 AU -- around the central orbital distance of the Main Asteroid Belt in the Solar System -- with an orbital period of several years. Even if an Earth-sized planet has already formed around young Zeta Leporis, it is unlikely to have cooled off sufficiently to have formed crustal rock. After it cools off enough for life to develop, only primitive single-cell, anaerobic bacteria is likely survive under constant bombardment by meteorites and comets as Earth was for the first billion years of existence. Since there is unlikely to be free oxygen in the atmosphere of such a planet, it probably would not have an ozone layer (O3) although Zeta Leporis puts out a lot more hard radiation (especially ultraviolet) than Sol. Astronomers would find it very difficult to detect an Earth-sized planet of this star using present methods. The following table includes all star systems known to be located within 10 light-years (ly), plus more bright stars within 10 to 20 ly, of Zeta Leporis. Up-to-date technical summaries on these stars can be found at: the Astronomiches Rechen-Institut at Heidelberg's ARICNS, and the Nearby Stars Database. Additional information may be available at Roger Wilcox's Internet Stellar Database and from www.alcyone.de's entry for HR 1998. Located in the Southern Hemisphere, Constellation Lepus (the Hare) can be found just south of Constellation Orion (the Hunter), a favorite prey of the Hunter and his hunting dogs. While believed to be ancient, the cultural origin of this constellation is unknown. For more information about the stars and objects in this constellation, go to Christine Kronberg's Lepus. For an illustration, see David Haworth's Lepus.